A tablet here, a tablet there, Old McDonald had a tablet…I suppose there is a new kind of primary school song that we can teach our kids to sing even right now, considering how the tablet craze does not seem to stop with a spanking new tablet seemingly appearing once in a couple of days from the myriad of manufacturers out there. One of the latest models to arrive on store shelves, virtual or otherwise, would be the eLocity A7+ tablet that will sport the Tegra 2 system on a chip, not to mention a 7″ touchscreen display at 1024 x 600 resolution which should be crisp enough for your everyday use. The asking price for this puppy? We’re looking at just $229.99 a pop, where you can pick it up from J&R, NewEgg.com, ShopNBC as well as other prominent US retailers. ShopNBC is said to start airing customized eLocity A7+ value bundle sales from December 8th onwards, all the way to the 19th, 2011. What makes the eLocity A7+ so special to receive this kind of seemingly royal treatment? For starters, this is a limited edition release for the upcoming holiday season, and will be available only while stocks last. Orders placed will be shipped to consumers almost immediately, so as the saying goes, the early bird gets the worm – you might want to be an early bird in this case to get yours before Christmas day. 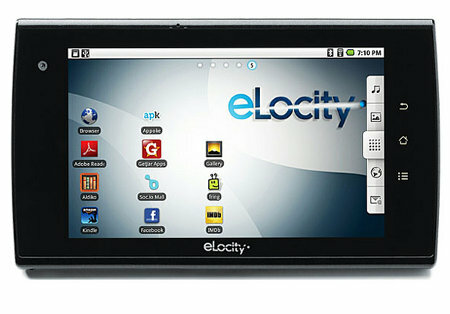 The eLocity A7+ will see the recently launched Amazon Fire and B&N Nook tablets as its main rivals, which is why eLocity decided to pack it with a more powerful CPU, the Tegra 2 processor, full Flash support (never mind the fact that mobile Flash has been killed by Adobe), a full local browser that keeps your data private, a GetJar App Store that offers access to thousands of apps and expandable memory of up to 100GB – all without costing more than the hot selling Amazon Fire, now how about that? Oh, why does Samsung tease us with this transparent flexible tablet video?